The Third Edge of the Sword: Stop using glaciers to demonstrate "climate change"
Stop using glaciers to demonstrate "climate change"
Every once and a while a warmmonger will try to use glaciers to scare the populace into buying into their global warming lie. This week's perpetrator of this falsehood is Renee Tratch from The Weather Network, who talks about how artists (who specialize in making stuff up) can teach us about global warming. No, seriously. But it’s not just scientists who are concerned about the increasing vulnerability of ice. Artists have been finding beauty and tragedy in the planet’s rapidly changing landscapes ever since they first started exploring the world’s icy regions in the 1800s. Torontonians need only to travel north to Kleinburg for a new perspective on ice. Until April 26, 2015, the McMichael Canadian Art Collection presents a unique look at climate change through its feature exhibition Vanishing Ice: Alpine and Polar Landscapes in Art, 1775-2012. The showcase of 70 works from the Whatcom Museum in Bellingham, Washington depicts a 200-year period of alpine, Arctic and Antarctic landscapes through the eyes artists, writers and naturalists. Hey, remember when global warming scared the Victorian English into rejection industrialization and going back to the bubolic conditions in villages? No? Even though famed satirist and extremist author Charles Dickens told lies about the perils of industrialization in a way that makes David Suzuki look like a reasoned and sensible analyst? One of the most powerful is the juxtaposition of Arthur Oliver Wheeler’s 1917 image of the Athabasca Glacier in Jasper National Park and Gary Braasch’s 2005 photograph of the same location – a startling comparison of how much the glacier has disappeared. It's only "startling" if, like Renee, you're expected to not ask the most obvious question:what do glaciers do? The answer, for those who (also, like Renee) don't know, is that glaciers either expand (get bigger), or retreat (get smaller). Retreating happens in the summer, advancing in the winter. On balance the glacier will either gain or lose ground. Expecting a glacier in nature to remain at a stable equilibrium is patent nonsense. If the glacier is advancing, then it's a glacial period and on balance this would be very very very very very bad news. Fortunately we aren't in a glacial period right now, so that means that these glaciers will be...anybody? Anybody? Bueller? Yes, that's right kids. Glaciers should all be retreating. If you see a glacier going the other way, run (though you can probably run pretty slowly). Which leads us to the obvious question: if glaciers are all retreating, and we cannot envision a positive scenario in which they are not, then why on earth should glacier retreat be waved at us as a concern? Here we have a picture of the 1917 versus 2005 pictures of the Athabasca Glacier. 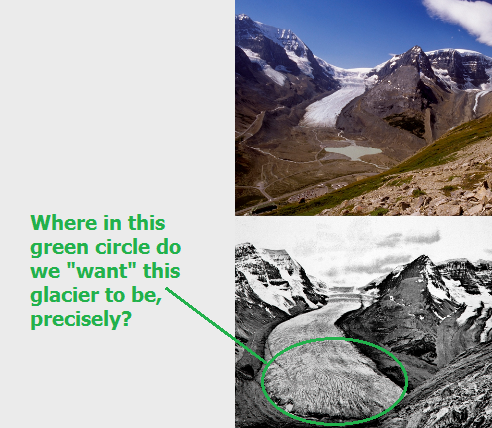 The green circle shown indicates the part of the glacier that has melted away. here's how it looked in 1964. What Renee and others like her don't want to tell you is that somewhere in that green circle is where the glacier is "supposed" to be if there was a universe with no humans in it, and they have no idea where that line would be. They can show you where the glacier was in 1910. They can show you were the glacier was in 2010. What they can't show you, and what they'd like you to not ask, is where the glacier was in 1510, or 810, or 20,090 BC. At some point, if you're reading this in Alberta, the answer to where the glacier was is "right where you are standing". Would you prefer this? If yes, what the hell is wrong with you? If no, then what the hell is wrong with it being exactly where it is?